Rum balls are a welcome dessert at any time, but are particularly popular during the holidays. They are kind of a grown up Christmas cookie recipe. Melt the chocolate chips over low heat in a double boiler. Remove them from the heat and blend in the sour cream. Refrigerate the mixture overnight. The next day combine the wafer crumbs with the butter, cocoa, icing sugar, rum and nuts. Mix them together well. Form the chilled chocolate mixture into tiny balls and roll them, first in the crumb mixture, then in the chocolate sprinkles or coconut. Store in an airtight container in the refrigerator for 24 hours to allow the flavors to meld before eating. 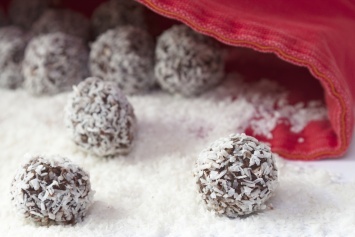 This rum ball recipe makes 3 dozen balls. Don’t like the rum flavor? You can replace the rum with other liquors like orange liqueur or whiskey if you prefer. If you don’t have a double boiler use a shatter proof bowl (like stainless steel) over the pot of boiling water. It keeps the chocolate from burning. If you melt the chocolate in a pot which is directly on the heat, just keep the temperature low, stir constantly and watch it until all of it is melted. These little gems are also perfect for a Christmas cookie exchange and a great addition to a buffet table with other goodies. Although adults love the rum flavor, you don’t have to use real rum if you prefer not to. Rum flavoring would work nicely too, although you don’t need anywhere near as much if you use the flavoring. It is very concentrated so a few drops will do. Taste it before you add another few drops as they aren’t as nice if the flavor is too strong. If you are using the rum flavoring instead of real rum, you may need just a bit of water to get the right consistency in the cookie dough. It needs to be thick enough to hold it’s shape and roll but still moist. Find more delicious dessert recipes as easy as these rum balls right here.